During the 2017 event “Open! The Architects open their public studies”, promoted by the National Council of Architects, our five studies have decided to give life to a collective event that showcased our work as a single set, the product of a community based on a common training and reinforced by frequent collaborations in architectural competitions. The exhibition is divided into three scenes. The first, in the lobby of the Palace of Lorenzo Cattaneo, is inspired by the card game designed by Charles and Ray Eames, and consists of an installation of 212 cards on which are reproduced drawings, photographs of models, collages and graphic elaborations that show our common passion for architectural representation, not only as an ex-post restitution of a project but as a fundamental research and design process. The second, within the PIA office, consists of a video projection of the works carried out or still in the process. 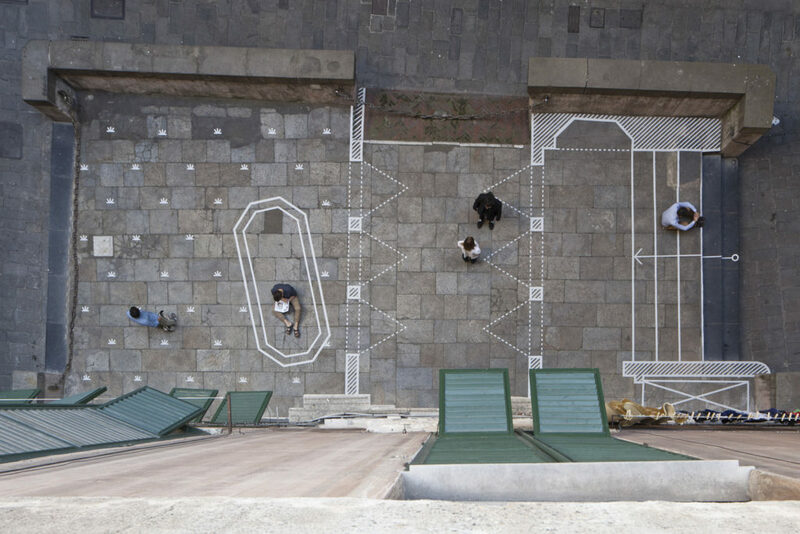 The third scene instead occupies Piazza Grillo Cattaneo, on which the other two spaces overlook, and consists of two-dimensional plan representation and in real scale of a space ad-hoc designed. This is not only a play on the contrast between inside and outside and the necessary capacity to imagine what is not there, but also a consideration of the role of the architect as a mediator between private self-interest seeking a synthesis for the collective interest and For architecture itself as a place for both physical and ideal meeting among people.